Bali is facing a potential plague of poisonous insects. 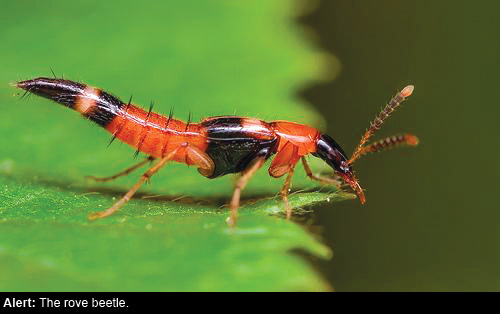 The rove beetle, known locally as tomcat beetle, is currently infesting areas of East Java, and the first incidences of the insect have now been reported in Buleleng. The beetles can cause violent skin irritation if they come into contact with humans. Last week eight residents of the coastal Kampung Bugis community in Buleleng suffered rashes after coming into contact with the beetles. On Thursday local woman Sumiati, 41, reported suffering a severe rash after an insect landed on her face. Neighbourhood chief Subagiyono said he had reported the matter to the authorities. “I have reported the cases to the local health agency and veterinary office,” he said. Head of the Buleleng Health Department Made Sukarmini said officials had already visited Kampung Bugis to treat those stung by the beetles, which cause itching because of the presence of a toxin, pederin, in their bodies. Meanwhile, a boy who reported a skin irritation in Kuta at the weekend has not been confirmed as a tomcat beetle victim. Head of the provincial health department, Nyoman Sutedja, said that a team had been formed to monitor the spread of the beetles. “The team is now working in all rural and urban areas throughout Bali. We ask people to report tomcat beetles if they see them,” he said. Head of the Bali agriculture department Made Putra Suryawan said environmental pressure brought the insects into contact with more humans. “It is likely that the habitat of the tomcat has been damaged and diminished, and turned into residential areas,” he said, adding that development also reduced the population of natural tomcat predators such as lizards. He said that the beetles were only harmful if squashed or crushed against exposed skin. “If you are exposed, immediately wash the exposed skin thoroughly, in order to not develop a rash,” he said, adding that irritation could develop up to a day after exposure. Si eres bonita, porque te afeas?? Si eres fea, porque te ridiculizas?? Si eres ridicula, porque lo empeoras?? Que p*nches greñas tan asquerosas!!! Hoy no voy a poder dormir… gracias Coca!!!! Por lo menos canta chido? digo….